A Kudi, D Kalla, A Niba, S Danbirni. Effect Of Lamenss On Body Condition Score, Live Weight And Milk Yield Of Holstein Friesian Dairy Cattle. The Internet Journal of Veterinary Medicine. 2008 Volume 6 Number 1. Lameness is a major problem facing British Dairy herds, it affects the welfare of the animal and its ability to produce milk, and it also has major economic effects such as the cost of antibiotics and other treatments alongside losses from lost production. This research looked at 40 Pedigree Holstein Friesians over a three month period during which milk yield, live weight, body condition score and locomotion score was measured. 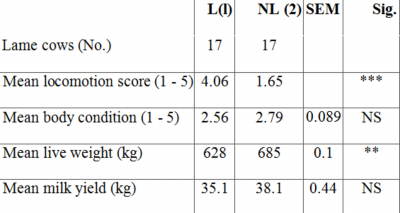 The results show the relationship between live weight and lameness (p<.05) and non significant differences with body condition (P>0.05) and milk yield (P> 0.0 5).The conclusion is that lameness has an effect on live weight but not on body condition and milk yield however a longer piece of research could show a greater effect over the whole lactation. Lameness causes one of the greatest losses of income to UK dairy herds, after poor fertility and mastitis (Anon, 1999; MacCallum, et al, 2002). The cost involved were set down by Kossaibati and Esslemont (1997) dividing them into three main areas; economic costs of treatment, loss of production and increases in culling rate and labour cost, as the treatment of the animal through procedures such as foot trimming can be time consuming. Lameness also has considerable welfare implications as it is a very painful condition and may lead to metabolic disorders as the animal can be unwilling to stand and/or eat and may rather lie down (Greenhough et al, 1981, Esslemont and Kossaibati, 1996). In Table 1 the percentage incidence of the different types of sole lesions, which cause lameness, is presented. Further research into the prevalence of different types of lameness can be seen in Clarkson et al. (1996). While there is considerable difference between the prevalence, incidence and causes of lameness between these and other surveys much of the differences between surveys has been attributed to the method by which the data was collected. Cows which suffer from lameness often see a drop in their physical condition especially at the beginning of lameness (Blowey, 1998). The animal is more likely to spend time lying in cubicles rather then eating which results in a reduced feed intake, as the animal is weaker she will then be unable to maintain her position in the pecking order of the herd and her position at the feed rail and so this too will result in a reduced feed intake (Blowey, 1998). If the animal is being milked then there is also the demand for milk production which will again have a cost on the physical condition of the animal as energy gained will be utilised in milk production rather then maintenance of live weight. There are many causes of lameness such as Digital Dermatitis, Slurry Heel, Sole Ulcers and White Line Separations (Ward; 1999; Weaver; 2000; Livesey et al., 2003) all of which cause pain and suffering to the animal and has an effect on the animal, in particular lying time, feed intake and subsequent condition of the animal's body in the form of weight loss. This will in turn have an effect on other factors of the animal such as milk production and reproductive ability, this will have far reaching effects to the dairy enterprise as a whole and so as a result of these factors it was an area in which an increased understanding could assist the future of the industry. As a consequence, the aim of this research was to investigate the affect of locomotion score and lameness has on feed intake, condition score and milk yield in dairy cattle. The experiment was carried out between November 15th 2003 and February 28th 2004. A total of forty Holstein Friesian cattle were selected at random from the University of Plymouth's Seale Hayne Herd and housed throughout in the same group in a cubicle based housing system consisting of 42 cubicles. All cows were offered a semi-complete diet on an ad libitum basis the same mixed ration (see Table 2) throughout the experimental period. The semi-complete diet was provided through a computerised feeding system which recorded individual animal feed intake monitored using the Meal Master Computer system (Griffith Elder, 2002). In addition, all animals received < 8 kg of compound feed in the parlour according to milk yield on a flat rate feeding basis. Locomotion score (LS) was measured as animals walked over a distance of approximately 10 m following afternoon milking. This was measured using a five point scale according to Manson and Leaver (1988), where 0 indicated no abnormality of gait and 5 which indicated clinically lame, with the animal being unable to place the affected limb onto the ground. At approximately 120 d pp, according to this locomotion score, animals were allocated to one of two treatment groups; Non-lame (LS 0 to 2) and Lame (4 to 5). The animals in the two groups were paired according to date of parturition and milk yield during the non-lame period. The body condition score was recorded weekly on a five point scale, according to Schwager-Suter et al. (2000) as used by Mulvany (1977), with 1 indicating the cow was very thin and 5 was equivalent to obese. Live weight was recorded twice daily while the animals stood on an automated and computerised weighbridge, following morning and afternoon milking (Walk and Weigh, Griffith Elder, 2002). The daily live weight data was smoothed and analysed as a repeated measure using a weekly mean. Daily milk yield was recorded on a daily basis using a milking parlour computer and software (Alpro system) in order that animals with a similar milk yield were identified and compared. The general health of the animals was recorded so that it could be taken into account should this affect the results of the experiment. The experiment was a completely randomised block design with cows selected at random from the herd and allocated to treatment groups at 120 d pp according to locomotion score. Lame and non-lame treatment groups were used as blocking effects and analysed as fixed effects in the model. The data was tested for normality and was found to be normally distributed and analysed using GLM ANOVA (Minitab 13). The existence of significant differences was assessed using the P value in the ANOVA Table. The statistical analysis did not show a significant difference between the body condition scores of lame (L) and Non Lame (NL) cows, however there is drop in the body condition score that can be observed. In the graph shown hi Figure 1, one can see that the body condition score drops slightly compared to non lame animals, this is related to live weight. A drop in Body condition score is often as a result of a loss of body fat and a lack of willingness to get up and feed (Blowey, 1998). This coupled with a requirement to continue milk production will result in a drop of body fat. The animal builds up fat as a reserve for times when food is slack such as winter and during this time it will breakdown these reserves to provide additional energy to provide both for itself and its young. When the animal is not eating as much as it should it will utilise these reserves and so a drop in fat will be seen. As illustrated by Schwager-Suter et al (2000) body condition score is a measurement of the amount of fat under the skin and so a drop in the level of fat will result in a drop in body condition score. In this case the drop was not great enough to drop many points on the scale and so a significant difference was not seen. A significant difference was seen in live weight at P<0.05 as the live weight dropped. This can be seen in Figure 2, this drop in live weight would be the cause for the drop in body condition score as discussed earlier in this section. Again the cause of this lack of live weight, is predominantly due to the strains such as the pain which leads to an unwillingness to walk and feed (Blowey; 1998) surrounding her condition. An unwillingness to feed and an inability to defend her position at the feed rail will all have an effect on the cow's ability to put on and maintain live weight (Blowey, 1998). Statistically a significant difference was not seen with milk yield however a slight drop can be seen looking at Figure 3. 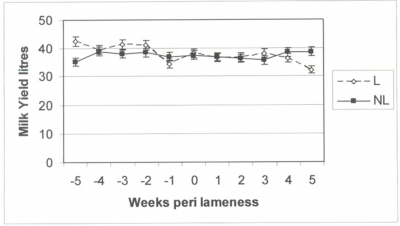 Lack of feed intake alongside the pain and stress of lameness can affect milk production and this is seen, though not in an extreme variation as might have been expected. Lameness is often noticed when mastitis is also present as the animals pain threshold is much lower and this could mean that a drop in milk yield is seen for this reason rather then the actual lameness itself (Rajala-Schultz et al, 1999). Lameness has an effect on both body condition and live weight and some affect on milk yield, though this is slight and could be the result of other problems such as mastitis. Lameness in dairy cattle is undoubtedly a major problem. The pain and discomfort in the animal is very plain to see and so a greater understanding of the area is essential to aid the treatment of the condition and improve welfare. One therefore draws the conclusion that lameness has a negative effect on live weight which in turn has repercussions on body condition score. This study was only carried out over a short period of time and so my first recommendation would be to carry out a study over an entire lactation. The results showed data for an animal going lame and data for 5 weeks either side. Lameness can have repercussions from the physical stress caused and this can lead to major problems such as poor fertility (Blowey 1998). It would therefore be an interesting study to see the after affects of lameness over a longer period of time such as months rather then weeks. A closer look at the different causes of lameness and their effects, the question might be raised does all cases of lameness have similar repercussions for the animal or does digital dermatitis have a greater effect then sole ulcers, for example. This might be down to the severity of the condition or healing time, or the different housing and conditions experienced by the animal at the time surrounding lameness. As with many experiments it is difficult to cover all possible factors and so my main recommendation for further work would be to expand the trial over a longer period. r-0. Anon, (1999). 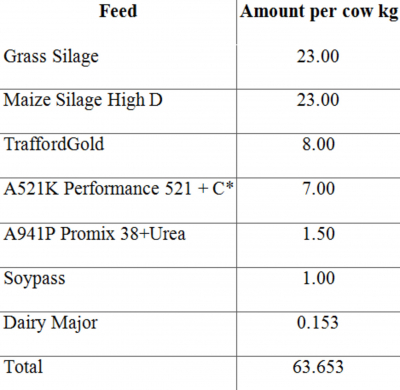 Costs of Lameness in Dairy Cattle. Veterinary Record 144:10:247-247.
r-2. Clarkson, M.J.; Downham, D.V. ; Faull, W.B. ; Hughes, J.W. ; Manson, F.J.; Merritt, J.B.; Murray, R.D. ; Russell, W.B. ; Sutherst, J.E. and Ward, W.R. (1996) Incidence and Prevalence of Lameness in Dairy Cattle. Veterinary Record 138:563-567.
r-3. Esslemont, R.J. and Kossaibati, M.A. (1996). Incidence of Production Diseases and Other Health Problems in a Group of Dairy Herds in England. The Veterinary Record, 139:486-490.
r-4. Greenhough, P.R. ; MacCallum, F.J. and Weaver, A.D. (1981). Lameness in Cattle Wright Scientiechnia, pp. 5.
r-5. Kossaibati, M.A. and Esslemont, R.J. (1997). The Costs of Production Diseases in Dairy	Herds in England. The Veterinary Journal 154:41-51.
r-6. Livesey, C.T. ; Metcalf, J.A. and Laven, R.A. (2003). Effect of concentrate composition and	cubicle bedding on the development of hoof haemorrhages in Holstein heifers after calving. Veterinary Record 152:24:735-739.
r-8. MacCallum, A.J. ; Knight, C.H. ; Hendry, K.A.K. ; Wilde, C.J. ; Logue, D.N. and Offer, J.E. (2002). Effects if the time of year and reproductive state on the proliferation and keratinisation of bovine hoof cells. Veterinary Record 151:285-289.
r-11. Rajala-Schultz, P.J. ; Grohn, Y.T. and McCuIloch, C.E. (1999). Effects of Milk Fever,	Ketosis and Lameness on Milk Yield in Dairy Cows. Journal of Dairy Science	82:288-294.
r-13. Ward, W.R. (1999). Lameness in Dairy Cattle - An Overview. Cattle Practice (BCVA)	74:333-340.
r-14. Weaver (2000) in Andrews, A.H. (2000) Ed.The Health of Dairy Cattle. Blackwell Science 149-202.